Velvet Paw Creations: Day 7: 12 Days of Creepmas with Smeared & Smudged! Day 7: 12 Days of Creepmas with Smeared & Smudged! Today is Smeared Ink Day which means we are challenged to use only Smeared Ink images in our creations! 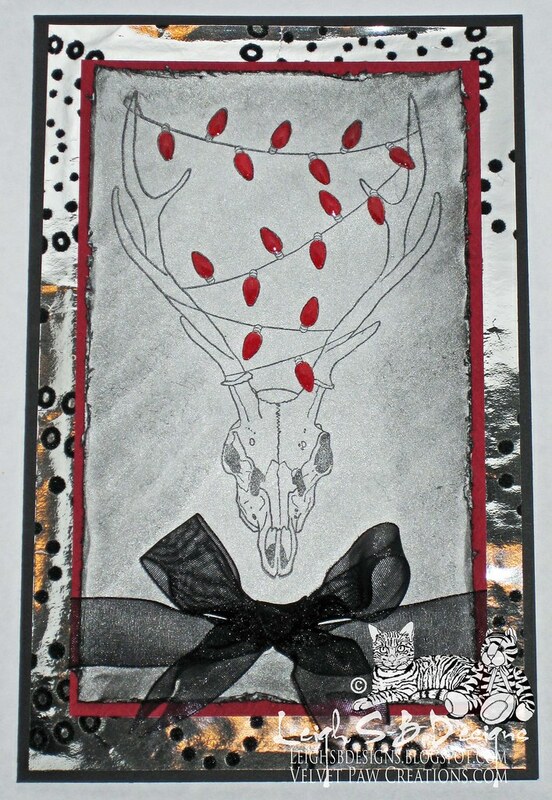 So I used Smeared Inks' 'Deer Skull - Gothic Christmas' rubber stamp and created this elegant card that would be suitable for a formal Creepmas event, don't you think! I painted a panel of white cardstock with metallic Brushed Pewter Distress Stain and stamped the image with Black StazOn ink. The strand of lights were coloured with a red Prismacolor pencil and coated with Judikins Diamond Glaze for the glass-like dimensional effect. The panel edges were distressed with Tim's distresser tool and distressed with Black Soot Distress ink. 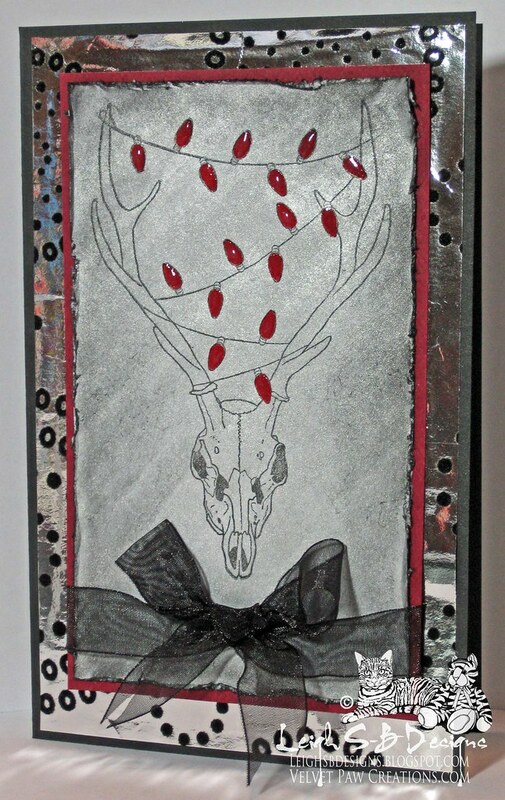 I layered the panel onto a deep red mat and then cut a mat from a beautiful silver foil and black flocked gift wrap I'd saved from a present I'd received many moons ago...I knew I'd use it one of these days LOL! I made a bow from black sheer organza ribbon, cut a length of extra ribbon and crinkled both with my heat gun. I wrapped the ribbon around the stamped panel and adhered the ends to the back of the red mat with double sided tape and the bow with a glue dot. Everything was then adhered to a black folded card with craft glue. Enjoy the rest of your Creepmas blog hop! Great card Leigh...love the bloodred Christmas bulbs. Thanks for sharing your darkside of art with us! Beautifully done. Love your technique here. nice. Nice distressing - this turned out great! extremely classy Creepmas card! Love it! Beautiful work!! I love the lights! Love your layered card and christmas lights!! Gorgeous! Love the grey with the pop of red, and that foil you've been saving is perfect. This is really awesome love that back ground, love how you did the lights! Thanks for playing at Smudgy Antics! lovely and gothic. Thank you for playing at Smudgy Antics!